For other places with the same name, see Okanagan (disambiguation). The Okanagan (often referred to as the Okanagan Valley) is a region of British Columbia, in Canada. It borders the Shuswap region to the north, West Kootenays region to the east, Similkameen region to the west, and the American border to the south. The focus of this region is the 135km long Okanagan Lake which runs north-south from Vernon to Penticton. The region is bordered on both the east and west by mountains. The valley is known for its hot, dry summers and is a favourite vacation spot for sun seekers and outdoor enthusiasts. It is also famous for its fruit orchards and wineries. Kelowna - Largest city in the British Columbia interior. Penticton - The 'Peach City' - amazing beaches, small town feel, and loads to do. Armstrong - Home of the Village cheese factory as well as the IPE. Enderby - Quaint, quiet town built on the Shuswap River. Lake Country - Amalgamation of four previously separate unincorporated communities -Winfield, Okanagan Center, Carrs Landing and Oyama. Westbank - Newest Municipality in Okanagan Area. Peachland - Built mostly on a hillside, but offers excellent beaches and scenery. Summerland - Beautiful beaches and benchland with an English-Tudor core. Naramata - Heritage town and center of the Naramata Bench terroir. Okanagan Falls - Sleepy town on the south shores of Skaha Lake. Oliver - Home of the Golden Mile grape-growing region. Osoyoos - Perennial summer hotspot in Canada. Okanagan Mountain Provincial Park - Hiking and camping. Silver Star - Alpine and nordic skiing outside of Vernon, plus mountainbiking and hiking in summer. As with most places in British Columbia (if not Canada) the Okanagan Valley's history is tied to the First Nations people who have made the area their home for thousands of years. Living a semi-nomadic life, the natives survived on wild game, berries, and the plentiful salmon runs. The first Europeans arrived in the area in 1811, and the first permanent settlement was a mission built by Father Charles Pandosy on the site of present day Kelowna. The early settlers subsisted on cattle ranching, and later, via the valley's hallmark fruit production industry. In the early 20th century many large paddlewheel steamships plied the waters of Okanagan Lake, shipping out fruit to other markets and returning goods and supplies to the many towns along the lake which were then still not connected by road or rail. Today, the Okanagan Valley has a permanent population of 297,601. The area has almost always depended on tourism, a continually growing industry fueled by the region's agreeable climate, thriving wine and fruit production, and virtually limitless opportunities for all manors of outdoor activities including boating and watersports, hiking and mountainbiking, rock climbing, camping, and fishing. The majority of tourists flock to the valley from the metropolitan regions of Vancouver, Calgary, and Edmonton, all of which are within a days drive. The amount of international tourists is steadily on the rise, not coincidentally, in proportion to the increasingly international renown of the area's many wineries. Geographically, the region runs predominantly north-south following the course of Okanagan Lake, and is framed by mid-level mountains on the east and west sides. Highway 97, which navigates the region, follows a different valley several kilometers to the east of Okanagan Lake north of Kelowna. 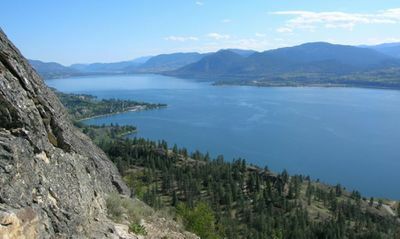 While the big lake is the most renowned, there are several other notable lakes in the valley including Kalamalka, Wood, Skaha, Vaseaux, Tuc-El-Nuit, and Osoyoos Lake. Weather is generally mild in the winter, with snow at the upper elevations and rain in the lower cities. In summer the region is quite hot and dry, and in fact this region contains Canada's only true hot desert in Osoyoos. The predominant language in the Okanagan (as with the majority of British Columbia) is English. You may hear French accents from the many Quebecers who come to the region for seasonal work at the many wineries, orchards, and ski resorts. However, as the number one industry in the region is tourism, you may hear any world language spoken by the thousands of visitors that make their way here every year. Highway 97 crosses the USA-Canada border at Oroville (USA) / Osoyoos (CAN). The border crossing is open 24 hours. Kelowna International Airport  in Kelowna services a number of domestic and US flights. Penticton Regional Airport  in Penticton services only domestic flights. International passengers (other than from the USA) will generally alight in Vancouver and either take transfer flights to Kelowna, or use alternate transportation into the region. Greyhound has frequent coach service from almost all points in British Columbia and beyond into the cities and towns of the Okanagan. The relatively sparse population of this region makes any sort of rail infrastructure (as Europeans may be used to) unrealistic. Public transportation in this area is underdeveloped. Kelowna, Vernon, and Penticton each have local transit systems (buses) that service each area, however, these services are generally geared towards getting residents to school, work, and shopping areas, rather than as a practical form of transportation for sightseeing. The easiest, and perhaps best, way to see all the sights is by automobile. Many destinations are outside of the cities and the only practical way to see them is to travel by car. The three main cities each have offices for most major vehicle rental agencies. Greyhound  has coach service to all points on Highway 97, which runs north-south in the valley. Hitchhiking is also a generally safe and acceptable way to travel within the valley. The relative proximity of cities and towns in the region also makes touring via bicycle a viable option. Okanagan Lake has a fabled monster called "Ogopogo". The myth of this beast predates western settlement of the area. The natives called the beast N'ha·a·itk or sacred creature of the water. They recorded its existence with pictographs, and they went so far as to carry animal sacrifices when crossing the lake to appease it. "A long sinuous body, 30 feet in length, consisting of about five undulations, apparently separated from each other by about a two-foot space, in which that part of the undulations would have gone underwater. There appeared to be a fork tail, of which only one-half came above the water. From Time to time the whole thing submerged and came up again." The beast was allegedly caught on film twice: in 1968 by Art Folden, and again in 1989 by Ken Chaplin. A search of the internet will turn up some of the grainy footage if you persevere. A few years back Penticton's Chamber of Commerce offered a two-million dollar bounty for definitive proof of the beast. Scientists were ready to validate claims, and Lloyds of London insured the prize, but alas the bounty expired unclaimed, without even a serious contender. Like "Nessie" you're more likely to see it on a t-shirt or hat than you are swimming around in the deep, glacial lake, but you never know. For a guaranteed sighting you can visit City Park in downtown Kelowna where there is a kitschy statue, or go diving at Paul's Tomb in the Knox Mountain Nature Park in Kelowna, where there is a likeness of the monster underwater at a depth of 25 feet. If you are interested in local history you will want to visit the many museums in the area. Almost all in the valley specialize in local history and artifacts of the respective area's development. There are museums in Armstrong, Vernon, Kelowna, Westbank, Peachland, Summerland, Penticton, and Osoyoos. The Okanagan has a wealth of activities to offer, year round. There are over 100 wineries in the valley, and it's worthwhile to do a wine tour and sample some of the wines and lovely vistas. The wines of the region are steadily gaining worldwide acclaim. Golfing. There are 37 courses between the US border and Vernon ranging from small par-three chipping courses to full sized professional top-50 ranked courses. The most prestigious include Predator Ridge Golf Resort (Vernon) , Gallagher’s Canyon Golf Club (Kelowna) , Harvest Golf Club (Kelowna) , The Okanagan Golf Club (Kelowna) , and Fairview Mountain Golf Course (Oliver) . Depending on the weather, some courses are playable right into December. Camping. The valley is literally peppered with campgrounds and RV parks, most of which are on or near a lake. For those looking for a more traditional tenting experience, there are over 60 provincial parks in the valley. Not all allow camping, but most have tent pads available for a modest fee. For those who really want to get away from it all, a short hike into the mountains will provide miles of untouched wilderness where one can practice leave-no-trace camping. Wine Tours. Do you love discovering insider tips on the winery you're visiting, getting the behind-the-scenes perspective with a barrel tasting, meeting the winery owner or winemaker, and not having to navigate from one winery to the next? Then booking a wine tour with the experts is the right choice for you. Let a guide with local knowledge take you around to our Kelowna wineries, give you the story on each winery and Kelowna's wine industry, and be your designated driver. You just can't beat it. The Okanagan Valley is home to cougars, bears, and (more to the south) rattlesnakes (and even scorpions). There are very few reports of these animals attacking humans, but it is wise to always be vigilant and aware of the dangers when you are in non-urban areas. As many folks come to the valley to spend their vacation in 'party mode' there is a tendency for some hooliganism and fisticuffs on the streets after the bars close. The RCMP have zero tolerance for this behaviour, so stay clear or you will find yourself put up in the drunk tank overnight. Head west to visit cosmopolitan Vancouver. Head north to visit the Shuswap's cottage country. Head east to visit the rugged Kootenays region. Head south to visit Washington, USA. This page was last edited on 29 August 2018, at 19:09.